Windows 8 Hybrid. Windows 8 makes it possible: the convertibles, a combination of a notebook and a tablet, are experiencing a Renaissance period. We are going to test the Dell XPS 12, which is equipped with an IPS display, and will show us if this fusion of technology can be successful. While the i5 processor here has plenty of oomph for your typical programs, you can get the XPS 12 with a more powerful Core i7 CPU and 256GB SSD if desired. While the Dell packs a lot of punch into a tiny frame, expect to pay a premium. Our test unit retails for $1,599, but prices start at $1,299. The Dell XPS 12 won’t match detachable laptop/tablets for their convenience or battery life due to its weight and thickness, but if you’re after a premium Ultrabook with tablet functionality built-in and don’t mind its lack of digitizer stylus, the XPS 12’s unique inner-bezel flip system works a treat looks super stylish. Throw in a Full HD IPS screen, excellent speakers, a great keyboard and flexible specs under the hood with good battery life, and this well-built machine is a recommended contender if you’re after a powerful Windows 8 convertible. The tablet mode isn’t entirely successful, but the XPS 12 will definitely earn its keep as a powerful, lightweight Ultrabook that you can use for work on the road or in the office. The tablet mode is really just a nice bonus for when you want to have a bit of fun, or let the kids loose with apps such as FreshPaint. The Dell XPS 12 is a solid performer with normal applications, and it can perform quite well even when faced with daunting multi-tasking. The unique flip screen form factor is complicated and probably that is the reason why nobody has attempted to imitate it. However, it does appear to be sturdy and should last long with normal usage. The bright 12.5" Full HD display is crisp and visible outdoors, and is also very responsive to touch input. It has most of the necessary ports except that there is no memory card slot or an HDMI port. A Display Port has been provided but that is not of much use, as we don't get too many display devices compatible with the same here. Providing an HDMI port or at least an adapter would have been better. While its dimensions are small, and Dell boasts of the carbon fibre body contributing to its light weight, it is not exactly as light at a little over 1.5 kg. Priced at Rs 95,000, the Dell XPS 12 is quite expensive, in fact Rs 5000 more than the Sony VAIO Duo 11, which performs a tad better. We would've have recommended Sony's device over the one from Dell, had it not come with a crammed keyboard or lacked a touchpad. We must say that most manufacturers have been pricing Windows 8 devices a little too steeply by simply adding a touchscreen as a novelty factor, when you can still use the device perfectly well with the keyboard and touchpad that it already comes with. With the advent of Windows 8, convertible Ultrabooks are quickly becoming the new meme for notebook manufacturers. Some provide an acceptable platform while many struggle to carve out their own niche, but one thing binds them all together: Microsoft’s new operating system. With that in mind, Windows 8 allows Dell’s XPS 12 to shine and also drags the entire user experience downhill. While the XPS 12 isn’t flawless, it’s a very interesting laptop nonetheless. To my knowledge, no one else is really trying this flipscreen approach; that’s either good news or bad news, depending on why most companies take an alternative route. If they’re doing it because making a good flipscreen is too challenging, costly, and/or prone to breakage that would be bad. The Dell XPS 12 is an excellent PC rather than a laptop - used as your main home system, it's portable, quiet and feels like a luxury experience thanks to a great display and highly usable keyboard and responsive touchscreen. The tablet mode works but it's one of the heaviest tablets in the world so only suitable for sofa or desk use. Even without the tablet skill set, it's an admirable and powerful machine tied to the home. The XPS 12's various problems are a shame as it does have other things going for it. The backlit keyboard is one of the best we've used - the large and responsive keys make typing a pleasure. The carbon fibre construction feels very robust. The XPS 12 is also fast. The dual core 1.9GHz Core i7 processor, 8GB of memory and the 256GB SSD make this a very fast computer. We went into this review a little annoyed that Dell were pushing a 1.5KG tablet but considering the quality and value using the XPS 12 purely as an Ultrabook we’re happy to say that if you want a high-quality Ultrabook and you can cope with the ports and battery life, the Dell XPS 12 delivers a great Ultrabook experience and offers you some occasional tablet-mode fun too. It’s incredibly well put together both in terms of electronic design and industrial design. The only question that remains is – can you afford it? The Dell XPS 12 is a very likeable and powerful full Intel Core convertible Ultrabook with an excellent full HD display, superb keyboard and beautiful fit and finish. We're taken by the carbon fiber surfaces that aren't just cool looking: they make for a grippier and cooler computer. Performance is in line with third generation Intel Core i5 and i7 Ultrabooks and the fast Samsung PM830 SSD drives are icing on the cake. Overall, we found the XPS 12 an interesting device, and one of the first we have seen that seems to have been designed to work well with Windows 8. However, like many ultrabooks, Dell has missed out many features that are important to corporate buyers, making this more appealing as a consumer device. Dell has carried out the same excellence from the XPS 14 as far as design and build is concerned, with the Dell XPS 12 Convertible Ultrabook. The display flip is a very unique feature to have. Performance is fairly acceptable, but the cherry on the cake is the battery life. But like most of these convertibles, they work better as laptops than as tablets. None of that takes away from the fact that you are paying a premium for the entire package because of the form factor. The Dell XPS 12 gets plenty right – it’s pretty, powerful and the Full HD display is excellent. However, despite all the hallmarks of an excellent Ultrabook, and tablet functions that work well, we can’t help fretting about the lifespan of those dainty little display hinges. There’s no doubt that it's up there with the finest Windows 8 hybrids money can buy, but if we had to make the choice, we’d put it just a whisker behind the tougher-feeling Lenovo Yoga 13. The Dell XPS 12 is a good compromise between a tablet and an ultrabook, although it excels at being neither. Connections are a bit thin on the ground compared with a standard laptop and battery life is a bit tight for a tablet. On the other hand, it's much more powerful than a stand-alone tablet and the flip-and-fold screen makes multimedia activities feel faster and more intuitive than with the average notebook. The Dell XPS 12 is one of the most powerful Ultrabooks you'll find. It might be heavy and awkward as a tablet, but when you consider the value that's on offer, with the blistering processor, 8GB of RAM and 256GB SSD drive, there's more than meets the eye. Having tablet functionality is an added extra that enables you to get the best out of Windows 8 when you need it, which makes the Dell XPS 12 a real heavyweight, in every sense of the word. But while a 12.5-inch screen and a weight of 1.54kg might be fine for an Ultrabook, they’re a distinct liability in a tablet. You can’t hold the XPS 12 in one hand, which means that you have to prop it up on your knees or on a table in order to use it properly. Ultimately, this tablet mode isn’t intended for work―it’s for those off-duty moments when you can put your feet up and browse the Web or watch a few films. The Dell XPS 12 might be pretty pricey but its great screen, compact and sturdy design, decent performance and of course the ability to transform into a tablet helps to justify it. If you can't wait to get your fingers prodding at Windows 8's colourful live tiles and can't decide between a traditional laptop and a tablet, the XPS 12 is definitely worth your consideration. 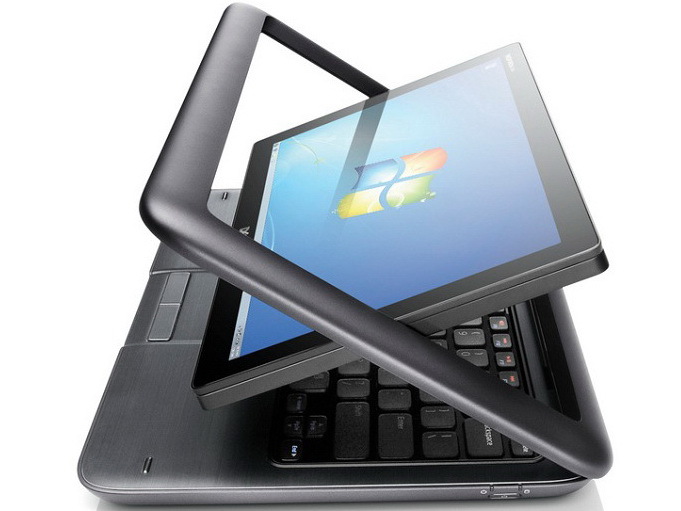 90% A Windows 8 Ultrabook that converts into a tablet? Dell’s attempt to create a non-compromising convertible laptop works as well as we could have hoped. The XPS 12 absolutely nails the fundamentals of display, endurance, and interface. We would be eager to recommend this device even if it were only an Ultrabook. The ability to turn it into a tablet is just a bonus. The Dell XPS 12 marks a move of the companies stylish ultrabooks into the convertible Windows 8 scene and does a very good job. While it is slightly smaller from its 12.5-inch screen, it offers a bright and high resolution picture with touchscreen capabilities well suited to Windows 8. It is just as fast and well designed as its predecessor. The XPS 12 Convertible Touch Ultrabook is a clever and stylish design, and it obviates the need to carry a tablet with you. At least if a Windows 8 tablet is what you want. It's on the heavy side, but that's may be a common theme with touchscreen laptops for the foreseeable future. It could also use another USB port, but that will limit relatively few users. Dell knocked it out of the park with its first Windows 8 convertible. The thin, light, and carbon-fiber-clad chassis make the hybrid a great option for on-the-go students and business types, especially when you factor the machine's all-day battery life into the equation. Few ultrabooks can match the XPS 12's keyboard, while few Windows laptops, period, sport such an impressive touch pad. Where the Sony VAIO Duo 11 left us nervous about the future of the hybrid ultrabook, the Dell XPS 12 puts us back on solid ground. While the design is a better laptop than a tablet, the XPS 12 is a solid performer, thanks to ultrabook-grade specs, long battery life, and a design than prioritizes comfort and usability. It's a bit early to be picking favorites, but the Dell XPS 12 is a front runner in the nascent hybrid category. As a laptop, I have no real complaint with the XPS 12. But, tragically, it’s largely unusable as a tablet. This is a real problem given the $1,200 starting price tag. In a world of $800 ultrabooks with similar configurations, you’re paying a hefty markup for a really, really nice touchscreen. That’s a tough sell, no matter how pretty it is to look at. If you're one of the few who remember the original Dell Inspiron Duo from 2010, pat yourself on the back. Like that Duo, the new XPS 12 has a screen that swivels at the middle of the lid's sides, so it can rotate 180 degrees along its horizontal axis and end up facing out from the back of the lid's frame.Dell has revamped its rotating Duo laptop concept into the much-improved XPS 12, but like most convertibles, it makes a better laptop than tablet. Though the XPS 12's size and weight make it a bit unwieldy as a substitute tablet, it's still a compelling option if you're in the market for a high-end, touch-enabled Ultrabook. The XPS 12 is almost as light as other Ultrabooks, with a premium industrial design, comfortable keyboard, gorgeous 1080p screen and a super-fast boot-up time. Positivve: Very well built with quality materials; compact size and light weight; Full HD IPS display; performance. Negative: Price. With the introduction of Windows 8, its touch-oriented interface and colourful tiles, many OEMs hastily launch laptops and tablets with touch screen to ride the wave of innovation. A new category for mobile device combines an ultrabook and a tablet and fully utilizes Windows 8’s metro UI and its traditional desktop mode to create a hybrid devices, which can both used as a tablet for casual web browsing, email checking, games, and as a work laptop. The XPS 12 is Dell’s first step into this new territory. The XPS 12 was based on the Ultrabook XPS 13, so the case is very sturdy and keyboard and trackpad are very pleasant to use in Ultrabook mode. What sets the XPS 12 apart from the competitors is the rotating display to transform the XPS 12 to tablet mode.The XPS 12 can be comfortably used as a laptop and a tablet, albeit less so in tablet mode. Although the XPS 12 is twice as heavy as the iPad it only achieves half the battery life. It is a powerful, lightweight ultrabook, which can occasionally be used as for web browsing or checking email. If you’re primarily interested in a tablet, you should look for detachable hybrids. Overall, it is still a very interesting device, which will satisfy the needs of business customers. 76.69%: This rating is not convincing. The laptop is evaluated below average, this is not really a recommendation for purchase.